Powerful FOG degrading products specifically formulated to solve commonly encountered grease related problems. Systems which are undersized; because of high flow rates, high FOG content, or outdated code requirements, will benefit greatly from regular use of ROETECH GT MAX. 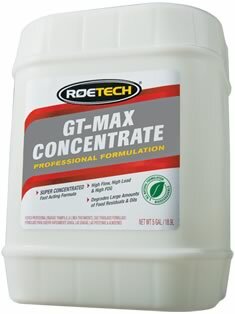 GT Max has been formulated especially for systems with a history of excessive FOG related problems. This powerful concentrate employs the effective FOG and odor control technology found in our regular GT product, but at levels which allow for its use in even the most difficult of systems. Regular use of GT MAX will significantly reduce noxious odors and also reduce costs associated with excessive grease loads. For best results, apply GT MAX at night when water flow is reduced to a minimum. Apply directly to sink drains, floor drains, grease interceptors, or grease traps. Great for use as a system rejuvenator!